3. Height adjustment: 24" to 37"
3. Height adjustment: 24-1/2" to 37"
2. 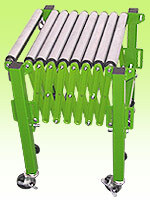 Variable Length: 14-3/4" to 50"
3. Variable Height: 23" to 36"
4. Load Capacity: 100 lbs. 5. Wheel 3" with brake. Make sure the situation of the place where the conveyor is. 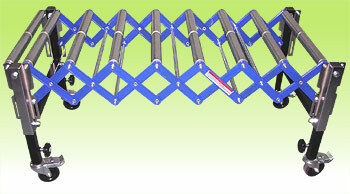 Link the conveyor to the proper position. Brake the casters of the first feet. 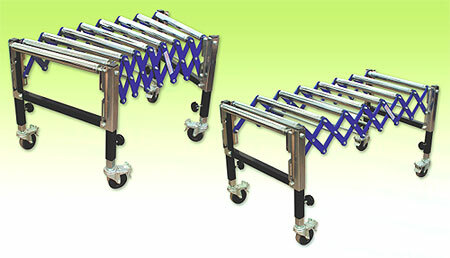 Extend the conveyor to the proper length and curve what you need, and then brake all the other casters. Set the stopper to its fitting place. Load the goods gently onto the conveyor. 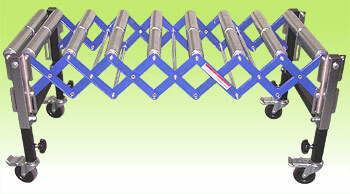 Easily link the conveyor set by set to the length what you need. 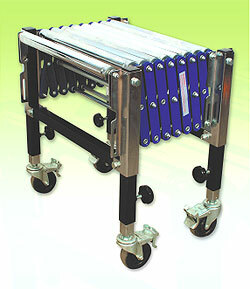 Height is adjustable from 26-1/4" to 37"
There are 9 piece of roller per set. Max extending length 51" per set. 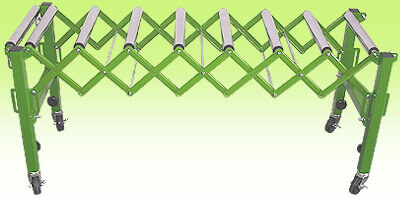 Compact length 16-1/2" per set. Wheel 4" with brake. Loading capacity is 300 lbs per set.